There are some scenes we could photograph every day without wearing them out. Not to say they wouldn't wear you out if we showed them to you every day, too. But there's just something about them that attracts us. The Old Pier. We never get tired of it. Pier 3 at Fort Mason, the Festival Pavilion, is one of those scenes. And it's taken us a while to appreciate just why. It's colors are attractive, to start with. The cream and international orange (like the Golden Gate Bridge) color scheme goes very well with the blue sky and green bay of sunny days. 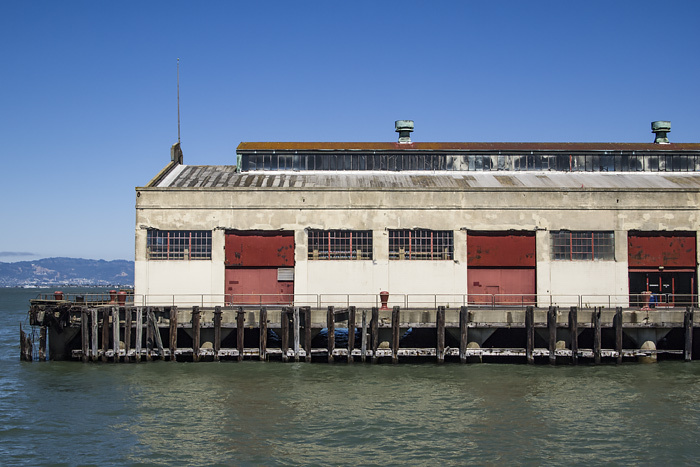 The deterioration of the metal doors and window frames is also interesting, particularly in contrast to the weathered pilings. Berkeley, sitting off in the distance, is another plus. As is the reflection of the pier buildings on the water. That's not just eye candy, either. It's a contrast between the decay of the man-made pier and the immortality of the sky and water. The sky does not decay. The water does not decay. They're the same, day after day. But the pier rusts and weathers and disintegrates. And still, it's the actor on this stage. And we always walk through the north galleries to find Whistler's gray pier, painted on a small wooden panel the year of his fiftieth birthday, its boards falling apart at the far end, a metaphor of old age itself. You would never know Whistler was 50 that year unless you looked at the date of the painting and compared it to Whistler's birth year. Nothing advertises it. You have to go looking for it. We must have been 50 when we went looking for it. And when we discovered the joke, we had to laugh. Come on, old man, it isn't that bad. It's just like 49, after all. But, thinking about it, he was predicting a life span of about 65 years, we calculated. He would have been on the last sturdy boards of that pier at the age of 50. The painting is an oil wash on a board in which the grain of the wood shows through like sets of waves. That's genius. There's a boat and some figures playing in the water, the pier in the distance seems an afterthought, just a decoration. But no, it's the actor on that stage. Which brings us back to our deteriorating pier, whose pilings are not crumbling into the bay, whose roof still keeps the rain out, whose windows close and whose doors lock. But whose concrete is crumbling and whose iron is rusting. Whistler perhaps was worried about physical decay. The body giving out before the mind. We, on the other hand, worry more about the mind giving out first. The edifice will still stand unlike Whistler's pier, but it may be empty inside. Oh no, not us, we say. Until we realize we are standing on Pier 2 to take the shot. And Pier 2 is, of course, is in exactly the same situation.